Carol Stream, IL : Oasis Audio, p2004. 3 sound discs (ca. 3 hr.) : digital ; 4 3/4 in. 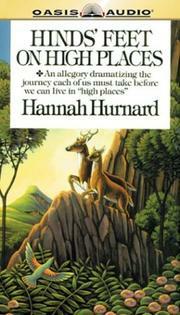 Hinds&apos; feet on high places [sound recording] / Hannah Hurnard. 100 ME:PersonalName 1 $a Personal name Hurnard, Hannah. $c Statement of responsibility Hannah Hurnard. $c Date of publication, dist, etc p2004. 306 Playing Time $a Playing time 030000. 511 ParticipantNote 0 $a Participant or performer note Read by Flo Schmidt. 520 Summary $a Summary, etc. note A Christian allegory follows the journey of Much-Afraid, a dweller in the Valley of Humiliation, to spritual heights in the service of the Chief Shepherd. 655 IT:Genre 0 $a Genre/form data or focus term Audiobooks. 700 AE:PersName 1 $a Personal name Schmidt, Flo.